By admin | July 12, 2015 | No Comments | New Mom? Constipation often gets misinterpreted as being the amount of bowel movements a person has in a day, but it actually is referred to as being the compactness of stools in the body, and not able to pass them. It happens because the muscles at the end of the large intestine tighten, which prevents the stool from normally passing. The problem with constipation seems to run in families, and it can start as early as infancy. If the child doesn’t establish regular bowel movements in their early life, this could present a problem later in life. Bowel movements in children vary just as they do with adults. It might be hard to tell if your child is constipated because one child may go more than two days without having a bowel movement, but isn’t considered constipated. Another child could have regular bowel movements that might be more frequent, but may have difficulty passing one or more stools. A child’s constipation may go unnoticed, especially if they pass a small hollow stool a day, having their colon build slowly with hard stools. If your child started to eat different foods then there used to, or switched the milk they were used to drinking. If your baby switched from receiving breast milk to formula, or even if they were drinking formula and now they started drinking cow’s milk. Too much cow’s milk can cause constipation in a child. If formula is the culprit, experiment with different formulas to find one that is the gentlest. Emotional. There could be many of emotions your toddler could be going through with can affect their bowel movements. Young children can go through many different negative phases in their life, causing them to be emotionally upset. 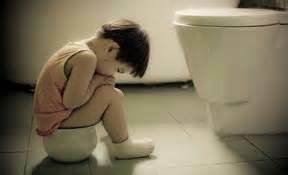 If your child feels sad about something, they may hold their bowel movements in. There’s also a possibility their intestinal functions may be upset, causing diarrhea or constipation. Fluids. If your child isn’t drinking enough, this can cause them to be stopped up. Consider giving your child more water during the day, with some of those drinks being 1/4 juice to 1/4 of water. Fiber. If your child isn’t getting enough fiber in their diet, this can cause their bowel movements to become infrequent and hard. Increase both vegetables and fruit in your child’s diet.